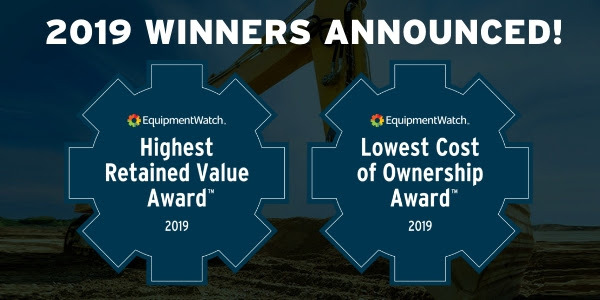 EquipmentWatch has announced the winners of the 2019 Highest Rated Value Awards (HRVA) and the 2019 Lowest Cost of Ownership Awards (LCO). EquipmentWatch gives the awards “to help equipment buyers understand the best performing machines, and to recognize the manufacturers who build them,” the company said in a release announcing the awards. Outstanding OEMs in 2019’s Lowest Cost of Ownership (LCO) Awards include John Deere with four total awards, Caterpillar with two awards, Komatsu with two awards, Volvo with two awards, and Bobcat with two awards. LCO Award winners are determined by EquipmentWatch costs analysts. Only equipment series which consist of at least one model were considered. The Highest Retained Value Awards included Caterpillar taking four total awards, Deere with three awards, Case with two, and Komatsu with two. To choose a winner, analysts looked at the most popular equipment series observed in the resale channel in 2018.